Only $99.99 from us with FREE Shipping! 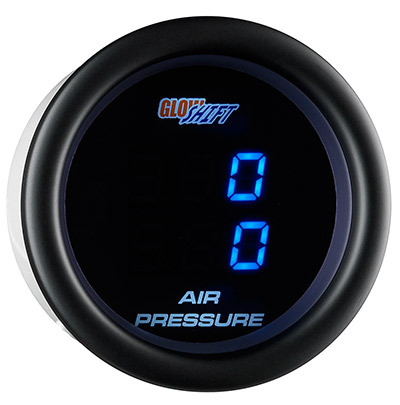 The Black Digital Dual Air Suspension Gauge features two separate blue digital air pressure readings allowing you keep a close eye on your changing air bag suspension conditions. Your suspension's air pressure directly affects the way your vehicle rides so monitoring and adjusting it is extremely important, and this dual air pressure gauge will let you know when to release pressure for a custom lowered look or to add more pressure for road imperfections. 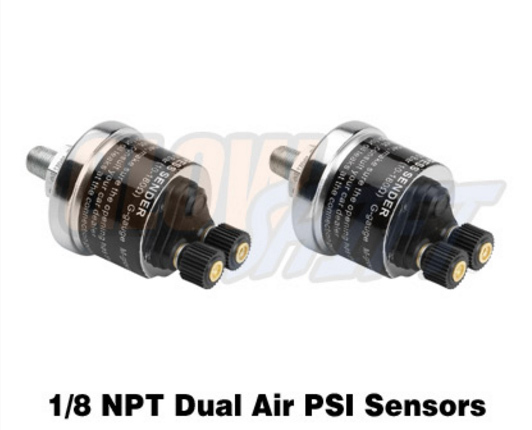 Including two electronic air pressure sensors that work completely independently of each other, this dual air suspension gauge reads air pressure from 0-220 PSI, and features 1/8 NPT threads making them easily installed to any tank, valve, or air hose. This gauge eliminates the need to run an air hose directly to the back of the gauge by utilizing electronic sensors, cutting down on your installation time. This gauge features a magnified lens and a blue digital readout allowing the pressure values to be easily read. This gauge not only features a blue digital readout, but also has a trim ring that matches our Black 7 Color Gauge Series assuring all of your vehicle’s gauges are a perfect match. For easier night time driving, this dual gauge also includes a dimming function allowing the gauge to dim up to 30% when connected to your factory headlight switch. GlowShift stands behind all of its products. Included with the purchase of every gauge is a one year limited warranty and free lifetime technical support. *Note: This gauge includes a 1/8-27 NPT thread size on the sensor and your vehicle may not come equipped with the same thread size. An additional threading adapter may be required for the installation of the sensor. If you are unsure if your application will require additional threading adapters, please contact us. This Dual Digital Air Suspension Gauge is Only $99.99 from us with FREE SHIPPING! Click here to return to our air suspension gauge page for more cool air gauges like this!